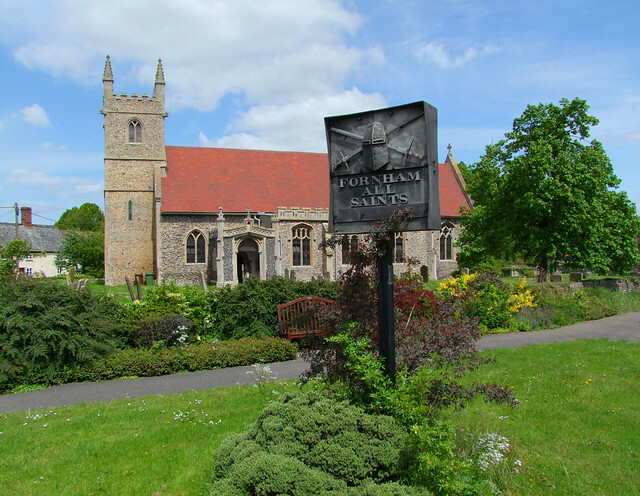 By the grace of God and the strictness of the local planning authority, Fornham All Saints still feels like a village despite its proximity to central Bury St Edmunds and the busy Bury to Mildenhall road. The church sits outside of a gentle curve in the village High Street, flanked by picturesque cottages and looking very lovely in the sunshine if you can catch it so. There are three Fornhams: Fornham St Martin to the east is bigger and busier, while Fornham St Genevieve, which lost its church centuries ago, has been subsumed into St Martin and is all commercial estates and golf courses. All Saints is by far the prettiest of the three, and its church is the most interesting. There was a decent restoration by the sometimes-ponderous Arthur Blomfield here in the 1880s, and the tower looks very characterful with its rabbit ears and manic grotesques. There is a late medieval flushwork inscription down the side of the south aisle, telling us that Thomas Edward paid for it, and Christ have Mercy on his Soul. The south porch predates the south aisle, and the aisle was built against the east side of it. Because of this, you step directly into the central part of the nave, creating the pleasing effect of the south aisle being a room going off beyond the arcade. This is accentuated by the way in which the aisle runs east of the chancel arch, while on the north side the aisle opens out into a wide transept. The overall result is a rather unusual layout. I found it interesting to wander around, seeing what the view of the late medieval high altar might have been like from different parts of the church. The interior is mostly of the 19th Century, although there are good medieval survivals. On the north side, a fleuroned image bracket is matched across the church by a rather fabulous canopied image bracket in the south-east corner. It must have been for something rather special, and today it is used to reserve the Blessed Sacrament. In comparison, the font, which must be about the same age, is completely plain. Was there a plan to have it carved, but the protestant Reformation intervened? There are benches of about the same date, but severely vandalised - the castellated bench ends would have supported figures as clouds of glory, but they have all been sawn off and you can see the repairs. The chancel is all Blomfield's, including the chancel arch which he rebuilt. The one surviving medieval feature is puzzling. It is a set of sedilia and piscina, but they are the wrong way round, the piscina to the west of the sedilia. Did Blomfield reset the piscina, or is the arrangement original? The nave windows are clear and fill the church with light, but the chancel has a very good east window by Hardman & Co of Birmingham. It depicts Christ in Majesty surrounded by his Saints, including a number of East Anglian ones. The figures of the Blessed Virgin and St Clare at his feet are particularly good. Finally, back to the west end of the church for a fine pair of 18th Century boards. To the south is the Decalogue, to the north the Creed and the Our Father. They would have hung above the chancel arch before Blomfield came along.